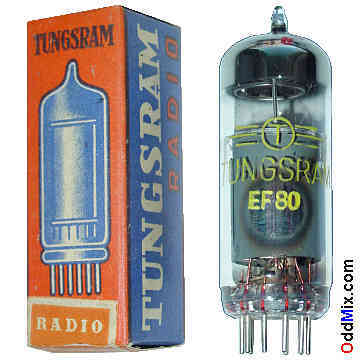 This is an original Tungsram EF80 Sharp-Cutoff RF Pentode electron tube. Subtitutes are the EU12, 6BX6 and the UF80 - this last tube has a different filament voltage - 19 V @ 100 mA. The EF80 is a great general purpose pentode. The tube is useable in VHF television and radio, SW, FM receivers. An RF/AF pentode is useable for many other circuits, oscillators and amplifiers. Excellent for antique radio or television restoration projects, instruments or to set up a private vacuum tube museum. It is a NOS tube - New Old Stock, unused, excellent condition.